California rappers 03 Greedo and Nef the Pharaoh have built a strong cult following with their vivid street tales and homages to legendary down-south rappers like UGK, Lil Boosie, and the Hot Boys. 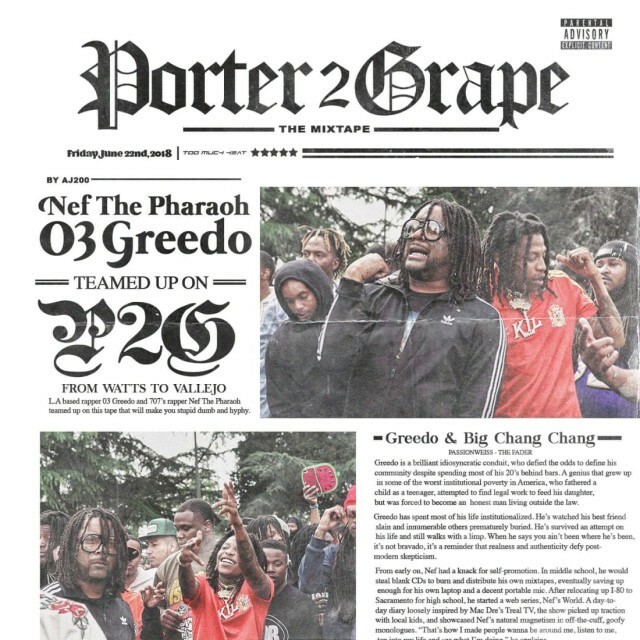 Now the two rappers have made a joint EP, Porter 2 Grape, that brings together their their hyper-specific vocals and rap styles to show how perfectly they actually meld. The new EP is a confluence of their love and knowledge of California and west coast rap, with inflections of the southern rap the pair grew up on. The new EP is just the latest project for 03 Greedo, who’s announced his intention to release as much music as possible via his team while he serves a 20-year prison sentence for drug and firearm possession. Greedo just released a new mixtape, God Level, late last month. Stream Porter 2 Grape below.